Zelenogorsk and Komarovo are two of the most popular dacha spots on the Karelian Isthmus. The inhabitants of St. Petersburg associate them, as they do Repino, with “culture” and holiday rest and relaxation in contrast to the usual orchard and garden tending. Firstly, they are located on formerly Finnish lands. Secondly, both before the revolution and during Soviet times, many of the dachas here, and later vacation homes as well, were occupied by creative people (writers, artists, architects) and academics. Many think that the name “Komarovo” comes from the mosquitoes that live on the Karelian Isthmus during the summer months. There certainly are very many of them, but in fact the Finnish village Kellomyaki was renamed in honor of the scholar-botanist and academic Vladimir Leontevich Komarov after the Second World War. Within 15 years, the new dacha settlement had nearly 800 dachas, including the country homes of the famous ballerina Mathilde Kschessinska and the jeweler who supplied the Imperial Court, Carl Fabergé. The early modernist architect Gavrill Baranovsky also had an intricately designed dacha, “Harp,” in Kellomyaki, which he himself designed (unfortunately it has not been preserved). In the early part of the 20th century, there was a theatre in Kellomyaki called the Ritz, in which visiting theatrical groups gave performances. In the 1980’s, the hit “This week or the next, I’m going to Komarovo ‘til the second,” where the settlement was represented as a real seaside resort, made it famous throughout the whole of Russia. It must be said that many of the facts in the song were made up, and that is why there are still topical queries on Google to this day. For example, where are the cliffs in Komarovo? There are no cliffs there. To this day Komarovo is considered by tradition to be St. Petersburg’s best dacha spot and everyone who can tries to build or purchase himself a dacha specifically here. In summer many culture and arts figures, as well as politicians, rest in this village. Even so, Komarovo remains a quiet place with a weakly developed entertainment infrastructure. Here, one can take a leisurely stroll through the dachas and pines and walk down to Pike Lake, a glacial lake with mirror-like waters, or have a peek at the famous Komarovo graveyard, where the poetess Anna Ahmatova, who had a small dacha – “Shack” (Can she really have called it “doghouse”? – translator’s note) – in the village, is buried, as well as the composer Sergey Kuryokhin. One may also visit Komarovo’s small local history museum, where the three main stages of the life of the village are on display: the Silver Age and the Finnish immigrant and Soviet periods. Part of the exposition recreates a dacha from the era of the 20th century’s fifties to seventies. If you head towards the Gulf of Finland, you must go down the picturesque slope that is the shore of an ancient sea. On both sides of the road, you can still see the old carved wooden farmhouses and gloomy stone houses that have outlived their century. Unfortunately, many of them are empty, which is sad but at the same time mesmerizing with a mysterious beauty. On the Gulf of Finland’s shore (which is very shallow in this spot), finally, you will encounter modern life. There are some restaurants here. There is the Bastion Restaurant, for example. Its extensive menu includes Russian, Eastern, Italian, Japanese, and American cuisine, as well as a rich wine list and excellent service. There is a summer veranda and children’s room, a Wi-Fi zone and live music. Or take the Belgian kitchen of Flamand Rose, which is overseen by head chef Eric De Smaele. Here you can find the most popular dishes of France and Belgium: the famous open tarts, bouche mignons, original salads and soups, classic and original desserts, and, of course, the traditional Belgian treat – waffles with honey, chocolate, and berry puree. The restaurant Mackerel, the name of a fish, has a pleasant airy and light interior and offers classic European cuisine dominated by seafood and fish. Here fish is roasted on coal, baked in foil, or steamed on coals or on the grill – according to the preferences of the guest. Zelenogorsk (formerly Terioki), the town neighboring Komarovo, is very well maintained and in summer is famous for its festive colorful lawns. Like any small town, it has a central thoroughfare still called Lenin Street. It is punctuated with Finnish and Soviet buildings that are quite original and unusual. On the right side of the street there are two churches. 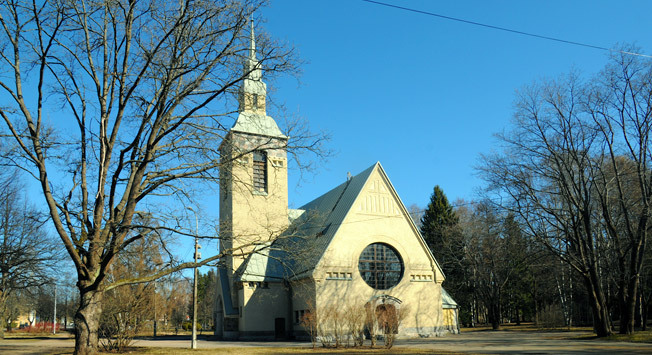 The stone Lutheran Church of the Transfiguration of the Lord was built in 1907-1908 by the architect Josef Stenback. There was a cinema in it from the 1940s on, but by 2000 restoration and reconstruction work had been carried out and the building was returned to the community. There is a Finnish graveyard adjacent to the church. And in August the musical festival “Summer in Terioki” is held at the church in the evenings. The master of the Neorussian style, the architect N.N. Nikonov’s Orthodox Church of Our Lady of Kazan was erected on the site of a wooden church that had been built earlier by the donations of the merchant Durdin. The church met with a difficult fate in the 20th century. It endured a hurricane, a flood, fire, looting, war, and shellings. At some point it was even turned into a warehouse. It was then planned to restore and refurbish it as the Kerelian Isthmus Museum. However, in 1988 the church was in the end returned to the Orthodox community. Today the church is active and you can always see the insane garden sculpture installations in its front garden. On the right side of the alley, on the gulf, is the Yacht Club – a modern building stylized after the historical one that existed here at the turn of the 20th century. There is a decent restaurant in it with a view of the sea, a pool, and rooms to stay in. It must be said that almost all of the Terioki dacha-goers in the pre-revolutionary period had yachts and the club was popular, participating in regattas and competitions. Von Haartman, for example, had a villa in Terioki. He was not only a yachtsman but also the founder of the Finnish Society for Light Shipping, which headed virtually all of the transport waterways in St. Petersburg and Sevastopol for a long time. He also launched the first trams in these two cities and in Nizhny Novgorod. A few of the historical intricately carved wooden houses belonging to the time of the “dacha boom” have been preserved (Myuzer Dacha and Villa Ainola), but most have been lost. The town Belle Vue’s oldest hotel still stands, a wooden structure built in 1874. In it today there are studios for master painters and an art school for children. Like all towns and cities that were located on the frontlines, in Zelenogorsk there is a common grave for soldiers killed during World War II – it is a stern granite memorial with an eternal flame. Not far from Zelenogorsk, in the settlement of Ilyichevo, is found the open air “Yalkalla” museum. The Museum was founded in 1940, immediately after the conclusion of the Soviet-Finnish war, as a memorial home for V. I. Lenin. The residential wooden home belonging to the Parviaynenov family once hid the future leader and was covered in a modernist-style concrete canopy during Soviet times. In 1993 a historical-ethnographic museum of the indigenous population of the Karelian Isthmus was built next to the house. Nearby there is a statue of a thoughtful Lenin buried in a book, hollowed out from a glacial boulder and rising from among the pagan wooden deities of the epic Kalevala. “Yalkalla” is a very strange, but cozy place in its own way.